The COSA-4055 is the smallest CWDM optical spectrum analyzer (OSA) on the market. The COSA-4055 module for the MTS-2000, -4000 and -5800 platforms offers the functionality and speed of an OSA in a handheld form factor at a fraction of the price of a traditional OSA. It is an ideal test tool for service providers to install, maintain and upgrade metro/access links and CWDM systems. 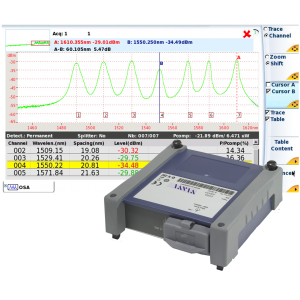 It measures wavelengths and power levels of CWDM channels and displays the complete spectrum.